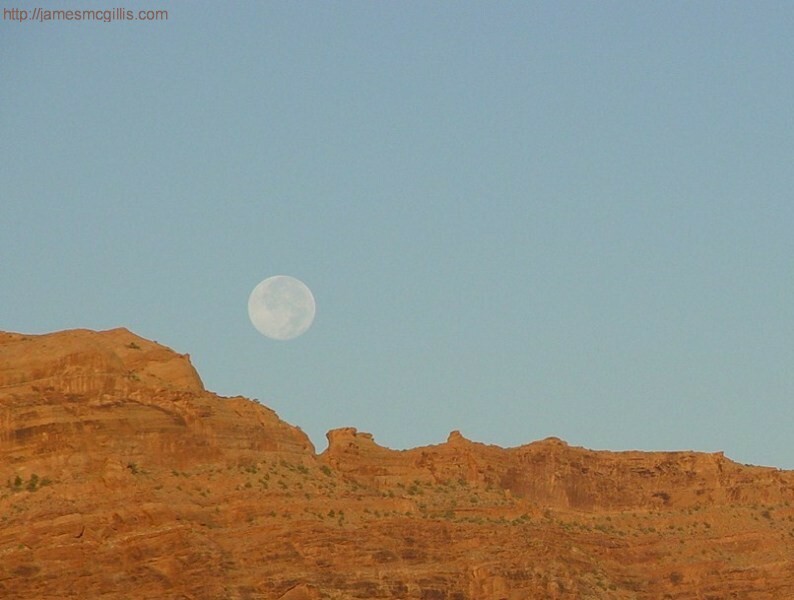 On October 15, 2008, I was up early enough in the morning to see the full moon, as it descended behind the Moab Rim. In anticipation of my first day at "Confluence – A Celebration of Reading and Writing in Moab", I drove to the Moab Arts and Recreation Center. Unlike the many public activities at Confluence, the intensive writing seminar was limited to only twenty-four individuals. 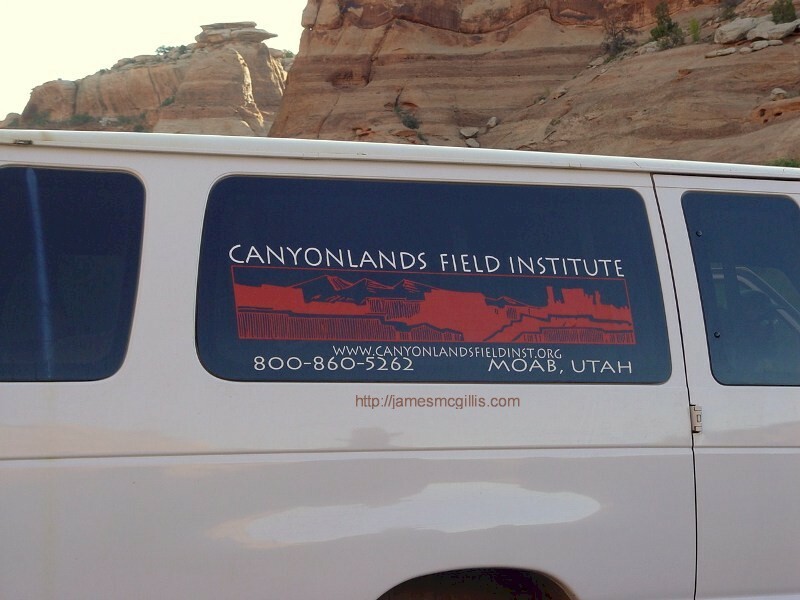 Moments after finding my group of seven fellow writers, we loaded ourselves into a passenger van provided by the Canyonlands Field Institute. None of us knew our destination for a day of hiking and writing. 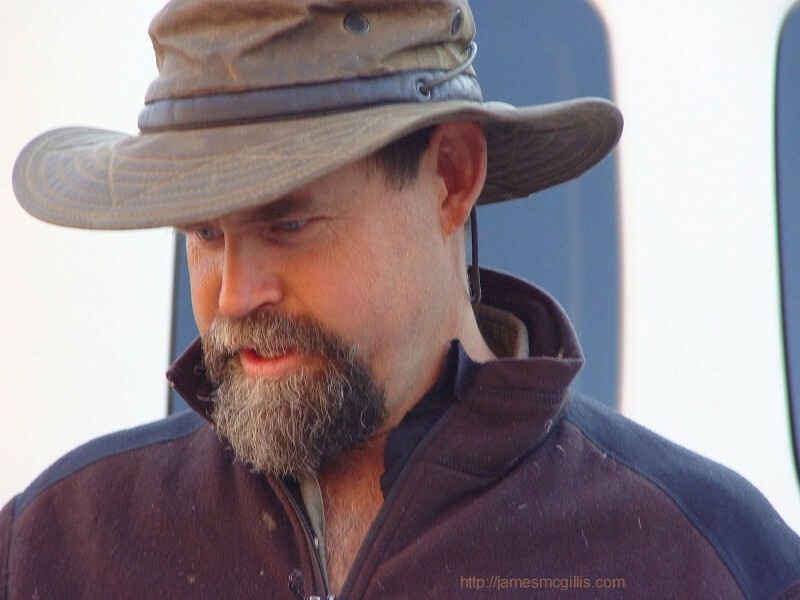 Having renowned author and expert on the desert southwest, Craig Childs as our personal guide for the day made those prospects even more exciting. Heading north on U.S. Highway 191, we crossed the Colorado River, then drove through the notch of the Moab Fault, a deep gorge that features the main entrance to Arches National Park. Five more miles up the road, we turned west on State Highway 313, which leads to Canyonlands National Park and Dead Horse Point, a Utah State Park. Only a mile or two from that junction, our van slowed and then our driver turned on to an unmarked road-stub. We all piled out of the van, and then surveyed the surrounding area. 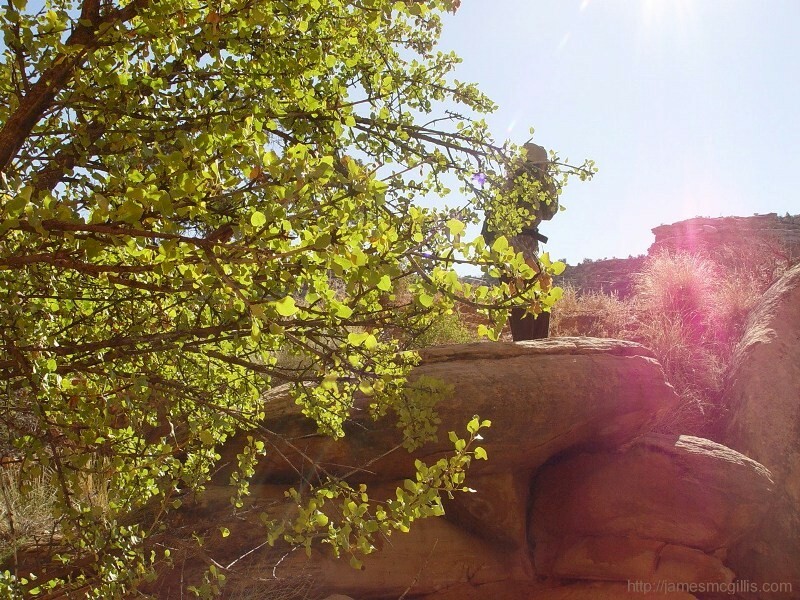 Knowing that Craig Childs had spent many months of his life hiking in and around the Moab area, we were curious why he would choose what appeared to be such an undistinguished spot to start our day. Not knowing what to expect, we crossed the highway and walked west toward a canyon wall, where the sunshine had begun to warm the morning air. 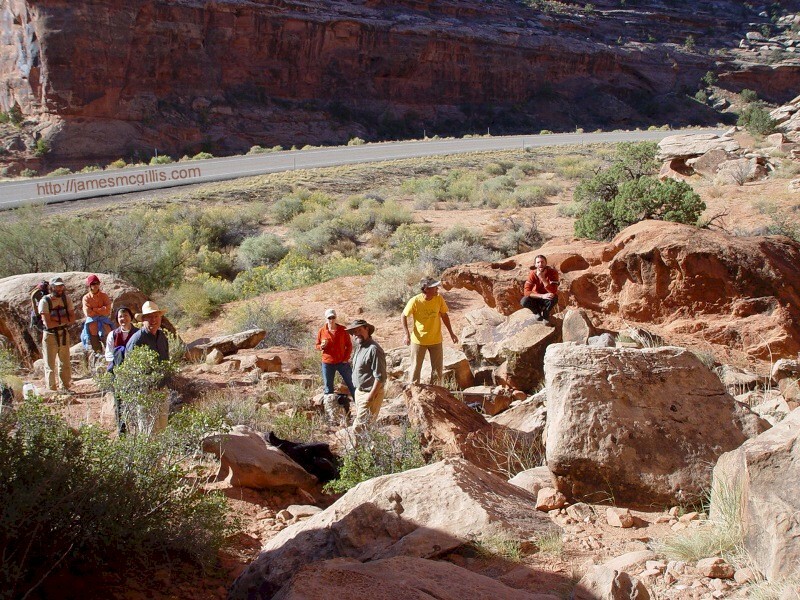 Once we reached a suitable place for our group to sit and listen, we quieted down and Craig Childs, the master of the canyons, spoke. In talking about the area surrounding the spot where we sat, Craig did not mention the sporadic traffic along the highway, only fifty yards away. Instead, he began a lesson in perception, inviting us to see these canyons as he sees them. Juxtaposing Craig’s intimate description of that landscape with the impersonality of what I saw as an unremarkable roadside made me feel uneasy. I felt like he could see things that I could not. After cautiously placing myself into Craig’s perceptual landscape, it became easier to see the uniqueness of that place, which was one of an infinite number of potential stops along that road. Having driven Highway 313 many times before, I knew that the landscape along that road was itself a paradox. On one hand, the highway meets our human needs to get somewhere. After passing photo spots of drama and beauty, the road ends at the equally dramatic Dead Horse Point. No one would dispute the beauty of the famous visual attractions near the end of the road. Yet, if one stops along the lower portion of the road, he or she will also find an abundance of unique and beautiful micro-environments. After completing our first small writing exercise, Craig stood and invited us to follow him around the far side of a large boulder. 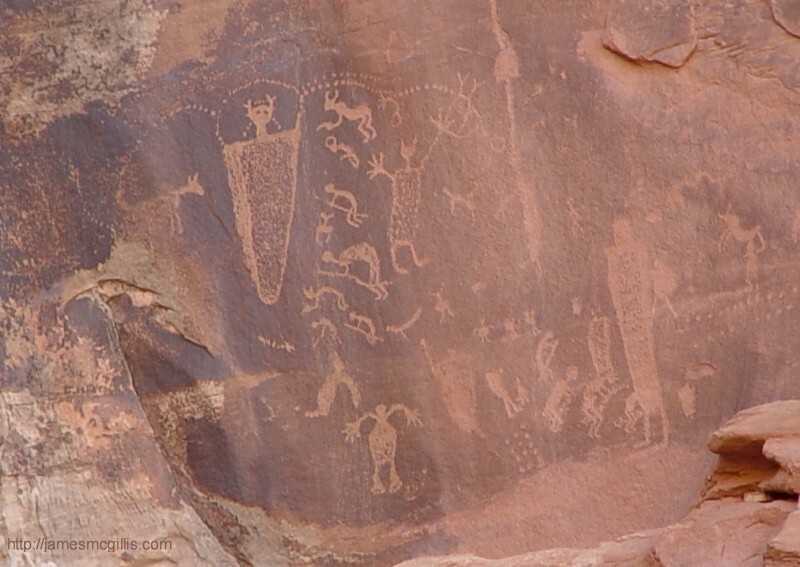 There, only a few yards away, were many examples of Native American rock art incised into the desert varnish of the canyon walls. Unlike many of the pictographs and petroglyphs that are visible from local roads, this great art had remained untouched since its creation. 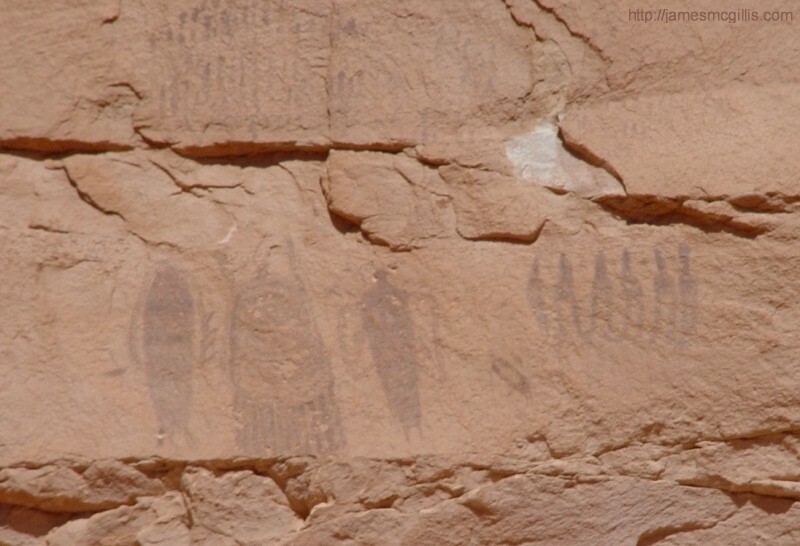 According to the style of that rock art, members of the Fremont Culture created it sometime between 600 and 1250 CE. If one needed a better example of Craig Child’s contention that there is unimaginable beauty available throughout the Canyonlands area, this art gallery, created by grand and ancient masters humbled me into recognition and belief. 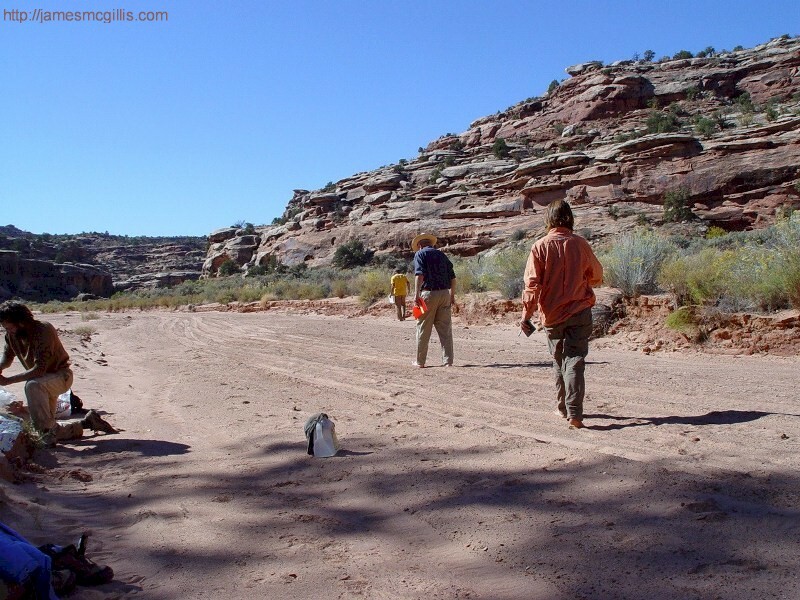 Soon, it was time to start our trek up the broad, flat wash of Seven Mile Canyon. Again crossing the road, we gathered beneath a cottonwood tree. Although SevenMile Canyon is open to both hikers and motorized vehicles, that morning we saw no one other than our group for the first two hours of our hike. With non-native bulrushes partially overgrowing the entrance to the canyon, the driver of a full-sized vehicle would scrape off a lot of paint in order to run that gauntlet and pass through into the canyon itself. While walking up-canyon, we began to feel the warmth and dryness of the desert environment. Frequent breaks for water helped facilitate our passage along the soft sands of the canyon bottom. Stopping in the shade of a cottonwood grove, Craig asked us to take off our shoes and feel the canyon sands beneath our feet. Once barefoot, each of us took off in our own direction. Our assignment was to find a place to sit and write about the feeling of being in touch with the canyon on that bright October morning. 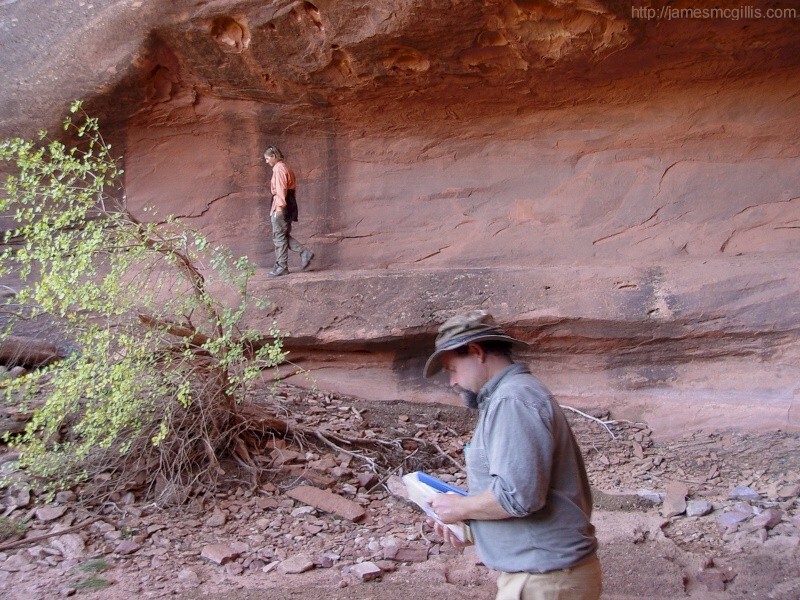 After a trailside lunch, Craig directed us towards a nearby, but partially hidden canyon wall. After a scramble over some boulders, we arrived at an intimate alcove, hidden from the sun by a massive overhang of Navajo Sandstone. In such places, one intuitively accesses a faith in geologic time. If, in eons of time, this stone overhang had not crashed down in a pile of rubble, why should let go as we walked into this stone sanctuary? When seasonal rains visit, the spot where we stood becomes a waterfall and receiving pool of a size and power that would drive any human back to a safe distance. On this day, there was no water pitching over the precipice and the receiving pool was dry. As with our previous stop, we found one wall of our secret canyon alcove covered with both Fremont Culture and Archaic Era rock art. Once again, we found no sign that anyone had visited this sacred spot since the last of the pre-Puebloan Indians chipped and painted their artwork into these walls. If you were to take the stone-age tools available to the ancients and attempt to make your own mark upon these walls, it is likely that you would quit before you created anything of note. Scientists estimate that each incised figure might take several weeks to complete. 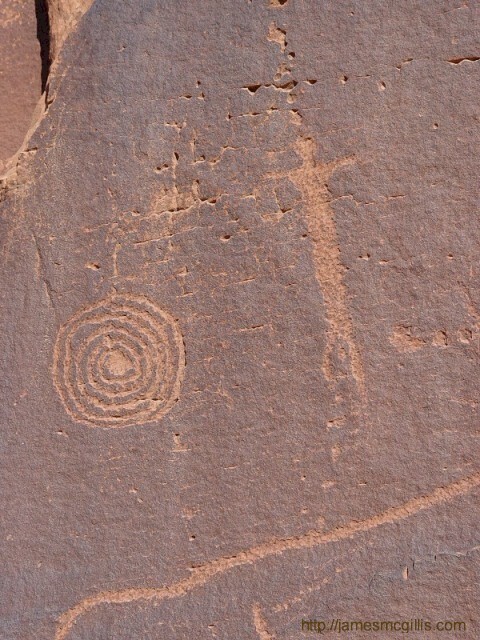 For that reason, the defacement of more accessible rock art is often in the form of bullet holes or surface scratches across the face of the artwork. How and why did members of these ancient cultures take the time and put forth the incredible effort necessary to decorate their home canyons? Our theory is that before European contact, there were times of lush abundance in the Canyonlands. Being efficient hunters and gatherers, good years allowed the ancients to fill their granaries with enough food to take them through the harshest of winters. In the best of years, their larders might be full by summer’s end, leaving leisure time sufficient for the ancients to pursue an activity that motivates almost every human culture. That is a desire to tell their story to other humans and other cultures who might later visit these canyons. 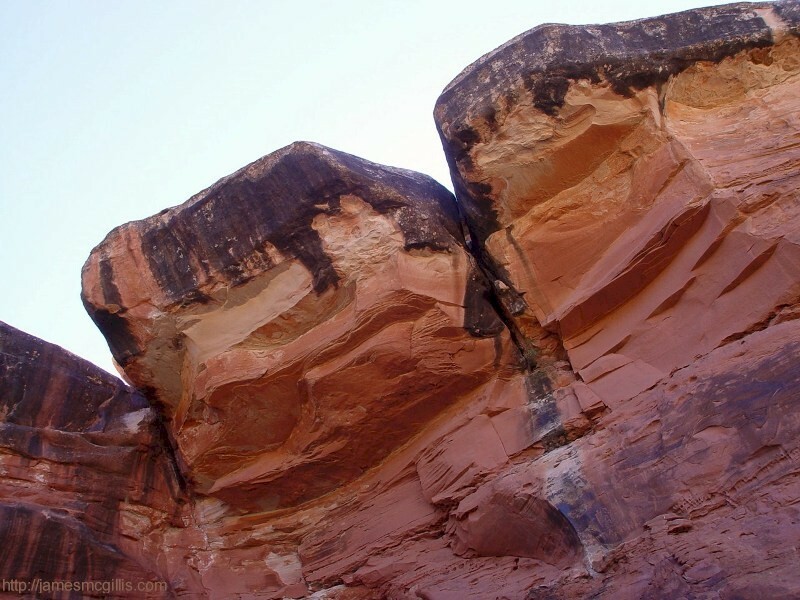 On a beautiful fall day, not unlike the one we spent among their galleries, the ancients may have carved and painted the story of their lives, their hunts and their spirit guides into these sacred canyon walls. To me, it felt like they had just been there, suspending their chipping and carving as we approached. Hearing our voices, had they retreated to be with their ancestors, waiting patiently for us to leave before returning to their timeless work? Thank you to Craig Childs and the Confluence Organization for transporting our group to a special place, where our contemporary world and the Canyonlands of our pre-Puebloan Indian ancestors converge. As with so many lessons in human life, we found that the similarities between them and us are far greater than the differences we so easily perceive.